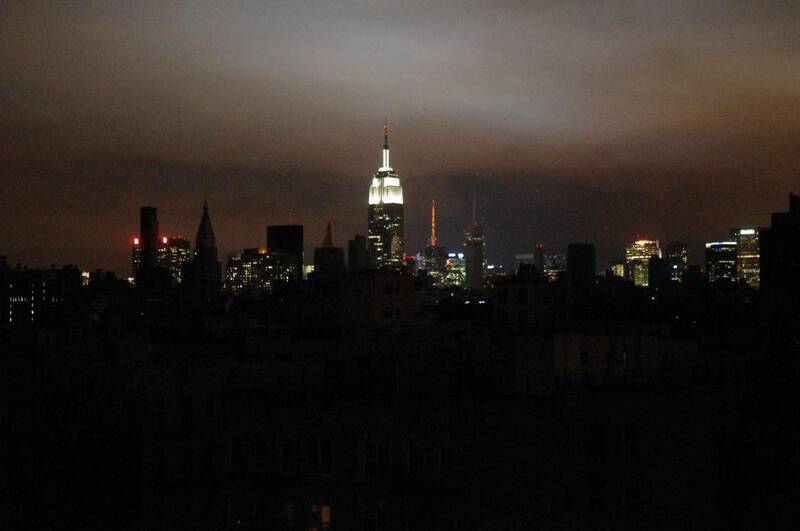 The United States’ electrical grid is old and vulnerable – power outages are on the rise. Each new natural disaster or powerful storm exposes that vulnerability. For New York it was Hurricane Sandy. Three years ago the storm blacked out many coastal areas for weeks. Now the state is looking for strategies to re-make and strengthen its electrical system. At Frank’s Pizza, on Main Street in Port Washington, Long Island, Linda Colombo does not stop working for an interview. While she talks with me, she slices pizza, pulls food in and out of ovens, and folds her famous pepperoni rolls. Port Washington, Long Island’s new power lines are the tallest things on the block. Some hope a microgrid will prevent the need for new lines like these in the future. Take away the electric lights, and add a headlamp for Linda and a crowd of hungry Long Islanders, and you have the picture of what the pizza place looked like the day after New York was hit by Superstorm Sandy. Frank’s only lost power for a few days, but other Port Washington residents were out for much longer. On Long Island alone, of the 1.1 million customers served by the Long Island Power Authority – or LIPA – 90 percent lost power during Sandy. In the aftermath, New York’s Governor Andrew Cuomo came down on the utility – hard. The state brought in a private utility company to take over most of LIPA’s operations. To upgrade service, that company blanketed Long Island with replacement utility poles, hundreds of which were in the Port Washington area. The town didn’t like that solution. So now, along with 83 other communities, they’re competing in a statewide contest to develop something different – a microgrid. The contest is part of a multi-billion dollar project in New York designed to strengthen critical infrastructure. A microgrid is a standalone electrical system that can operate independently of the larger grid during a storm or power outage. New York wants communities to develop them for critical services like hospitals and water treatment centers – and to keep residents’ lights on. And she is not alone. Up until recently, interest in microgrids has mainly focused on resiliency – keeping power on when the main grid fails. Francis O’Sullivan, director of research for MIT’s Energy Initiative, says that’s a natural fit for microgrids. It’s a suite of applications that will substitute diesel generators – currently the option of choice for powering many microgrids – with more green solutions. O’Sullivan says we don’t yet know what that might look like from place to place. But the number of examples is growing. Connecticut’s Wesleyan University has a microgrid, Alaska runs over 200, some as old as 50 years. Utilities in California are looking to microgrids as well, as a way to meet the state’s requirement that 50% of energy supplies should come from renewable sources, by 2020. “Only through that kind of learning by doing will we actually begin to understand what the practical benefits of microgrids will ultimately look like,” O’Sullivan said. In Port Washington, Germain says they’re looking at options like using the high school’s roof for solar, and looping the library and a senior housing center into the grid. A plan in the Bronx aims to protect New York City’s largest food distribution center. Towns elsewhere in the state want to incorporate tidal power, or use local dams to provide hydroelectric energy. Ultimately, fewer than 10 of the 83 projects under development will receive state grants for construction. In the meantime, Linda Colombo says she and her neighbors aren’t waiting around. They’ve taken resiliency into their own hands. We crunched the numbers and found that power outages are on the rise.